I presented a session on Social Learning at a Dutch learning conference today, ending the session by describing ‘Six Week Experiments’. This notion of short, focused, and achievable, experiments is something that i’m taking from the upcoming publication of ‘The Change Handbook’, which tries to reconcile broad and holistic visions of change, with the grinding reality of what we should do differently next Tuesday. We need both. The last couple of years have seen a broad and rapid shift in mindset and focus around learning: many organisations are implementing new technology, exploring collaborative communities, moving beyond purely formal approaches. But not always with aligned energy, or clear measures of success. This feels like a great area to focus on: we need learning transformation programmes, to address the big strategic questions, but we also need local, personal, and small scale experiments to inform that strategy. 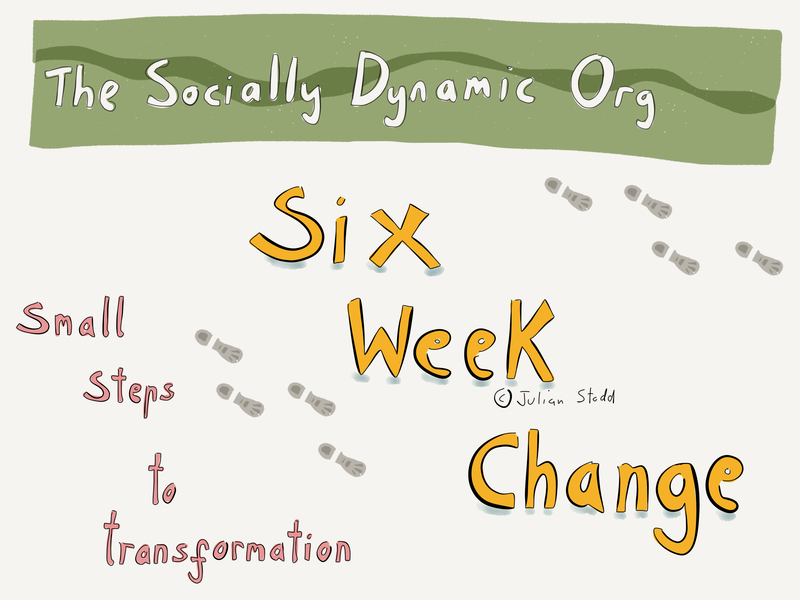 Six week experiments may be about creating a shared story, a community of difference, or a short diagnostic exercise. None of these experiments will reveal one big answer, but they are a manifestation of the mechanism by which we will work out the big answer. This entry was posted in Collaboration, Learning and tagged Collaboration, Experiments, Six Week Change, Social Learning. Bookmark the permalink.